With two weeks to go to the normal entry deadline, eager social cyclists can make their mark on the 2019 edition of the popular aQuellé Tour Durban, presented by Bridge Fund Managers on Sunday 28 April, by electing a charity that they will ride on behalf of. The 45km Fun Ride, offering an easy out-and-back ride up the M4 to Mdlodti and back is proving to be very popular with local riders, with the interest in starting in one of the preferential early charity batches gathering momentum. “One of the objectives of the aQuellé Tour Durban has been to try and use the event to make a difference in the greater Durban community,” said race organiser Gary Harman. “The race has been proudly associated with The Domino Foundation since the Club Cappuccino Foundation Trust took over the event in 2011. “Over the past few years we have offered the opportunity for riders to support The Domino Foundation and the CHOC Cows by riding in the Charity batch. This year we hope to broaden our impact with the addition of further charities who will also be participating in the Charity Batch Challenge,” he added. The Domino Foundation is encouraging riders to ride the race in their colours and support their group of young riders taking part in the race. They are also appealing to volunteers to assist with their seconding table, and to simply support all the riders during the race. The Cows have a solid group of their own riders taking part, some wearing the distinctive furry Cow suits, supplemented by supporters keen to ride for CHOC in the preferential early start batch. This year The Cows have a special group that will be riding the 100km race, stopping for a break and a bite to eat, and then riding the 45km race slowly with the intention of helping the slower riders with encouragement or a push up the hills. Anyone interested needs to be able to complete the 100km ride inside three hours and five minutes, must make a R300 donation to CHOC, and can contact [email protected] to join this group. Entrants can nominate their chosen charity when entering online here and normal entries close on 15 April. Riders can opt to ride for any of the race’s nominated charities, the Domino Foundation, the CHOC Cows, iThemba Lethu, iCare or Focus on iThemba in the 45km or 100km rides. 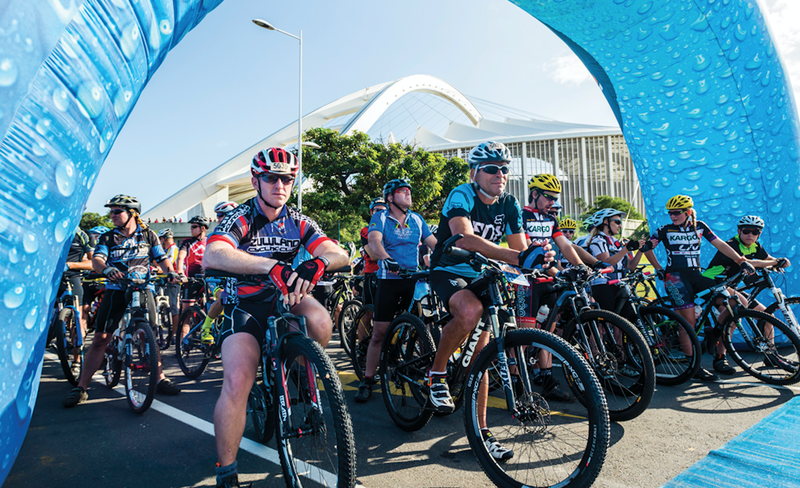 The aQuellé Tour Durban, presented by Bridge Fund Managers, takes place on Sunday 28 April 2019. More information can be found at www.tourdurban.co.za.